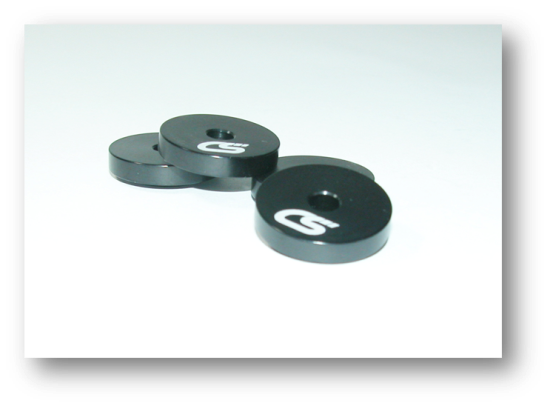 Eliminate side to side compliance and remove the slack on your shifter by replacing the rubber OEM shifter bushings on your 2007-2009 Mazdaspeed 3 with the CorkSport aluminum black anodized shifter bushings. Over time shifting gears can cause the soft rubber bushing found at the anchor point of your shifter assembly to deteriorate and fall apart. Replacing the Mazdaspeed3 shifter bushings will provide a noticeable difference in the way your car drives and improve shift responsiveness for years to come. Easy install. Awesome bushings that perform as intended. I love how more solid the shifter feels. Thx CS! Great add to my shifter assembly. The only reason I didn't give these a full 5 stars is the instructions could have been accompanied with a video warning of the pit falls of loosing the bearings on install. I think you could improve assembly issues by putting a double sided sticker on the bearing surface that mates to the shifter assembly surface. If the bearings were locked into place my assembly time would have been cut in half. It took me a while to fish out the bearing under the floor board carpet. With that said, the product was high quality and performed as intended. will these fit a 2005 2.3L mazda3s? These are specifically made for the speed. Will these work for a 2008 Mazda 3 N/A ?